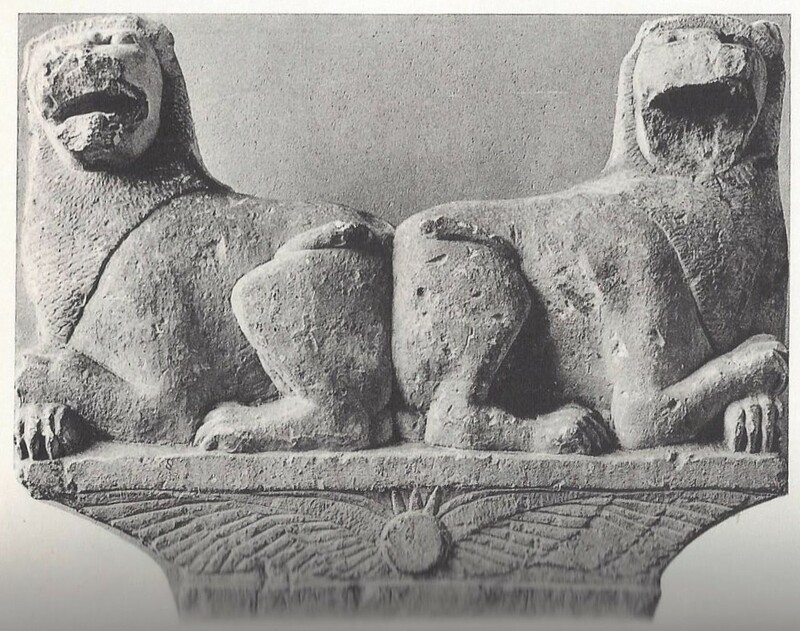 Located in the cemetery (necropolis) at Golgoi on Cyprus, this digraphic inscription is found at the base of a stele that includes two profiled lions facing the viewer and a winged solar disk. • (A) herald I (am). Notes: There is no obvious word separation between ka-ru-xe and e-mi, but the alphabetic Greek offers guidance regarding the crasis of the vowel coda of /xe/ and the following syllable /e/. Another interesting feature is the use of /V/ to represent the capital /Y/ (upsilon). Masson typically translates e-mi as ἠμί rather than ἐμίν. In its declarative sense, ἠμί can still incorporate the latter: κάρυξ ἠμί > “I declare (that I am a) herald.” Cf. the same declaration in modern Greek: κήρυκας ειμαι “(a) preacher (I) am”. According to Liddell and Scott, the herald typically carried a κηρύκειονa (kirykeiona) “a caduceus”, or “a wand that was entwined with two serpents, such as [that] borne by Hermes”. Cf. caduceus with ΚΑDVΞEΜΙ, Masson’s [1961:281] alternate transliteration of the left side, which may be re-transliterated as ca-du-ce-e-mi in syllabic Greek. The resemblance of Roman /D/ and Greek /Ρ/ (hro), as suggested by the shape of the letter in the inscription, implies that /d/ and the rolled /r/ are phonetically confounded. Masson, Olivier. 1961. Inscriptions Chypriotes Syllabiques. Paris: E. de Boccard, fig. 80, p. 281; Pls. XLIV and XLV.